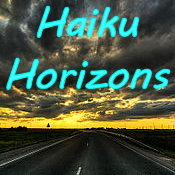 Welcome to Haiku Horizons! This site is a haiku prompt page. Each Sunday a new prompt will appear. You can post your own haiku in response to the prompt and publish a link to your response. The prompt page will automatically display all links to the prompt. Feel free to write multiple haiku if you desire. The only guidelines I will provide are to keep each haiku to 3 lines with no more than 17 syllables. The most common form is 5-7-5 syllables per line. Feel free to suggest possible prompts under the Prompt tab. thanks ! at last ! peaceful mind ! Wow!! A wonderful Initiative to keep the haiku-lovers engaged, oneofaclass!!! Rallentanda brought me here…thanks heaps, Rllentanda for your kind gesture. I don’t know how I misssed your comment for so long, but I’m glad you found us here, Panchali! Don’t remember how I got here but I am loving it! I’m glad you found us too! This is a great initiative on your part. Every body was missing Haiku Heights, you have given Haiku lovers a good alternative;. I have one observation. The post, depicting the topic is not visible on Sundays. Today is Wednesday. I saw it today. I checked it for the last three days/ but it was not there. Thanks for your kind words! I schedule ahead of time each post to publish automatically at 10:00 AM PST. While I’ve heard that subscribers don’t get notified immediately, that is probably because WordPress has much to do and the message is delayed. When I look, usually a bit later on Sunday, I see it is active and someone has usually posted their haiku. The posting date is also correct, so I don’t know why you didn’t see it. I go directly to haikuhorizons.wordpress.com and find the latest at the top of the list. Best of luck to you and thanks for your contributions! I take this as just another example of WYSINWOG (what you see is not what others get). I find it helps to remember that time is an illusion (lunchtime, doubly so). You have an interesting site going on here. I am looking for some ‘new blood’ for the next Showcase at ‘the zen space’, and for subsequent Showcases too – I’ll not put a link in this comment, but just search for thezenspace(dot)wordpress(dot)com. I’m not looking for ‘same old same old’ haiku; 5-7-5 is fine by me, but I am also looking for people who can do exciting, in-the-moment things in very few words irrespective of form. Please feel free to visit, everyone. Thanks for the visit. You’ll find a wide range of haiku here. Would you care to recommend some for me, so I can contact the poets involved? I only have a few days left until my next deadline. I’m in! I love to write short forms and read good haiku! See you next Sunday! Hi, I would like to follow your blog but I cannot find a “Follow” button. How can I follow your blog? Under the picture at the top right of the screen you should see a Follow Haiku Horizons button. Sounds strange to me. You might try a different browser and see if it makes a difference. When I hover over the icon, it points to https://widgets.wp.com/follow/index.html# so you might try entering that in your navigation bar. I’ve seen Firefox weirdness before. At one point I had to refresh it, which fixed several problems. See https://support.mozilla.org/en-US/kb/refresh-firefox-reset-add-ons-and-settings?redirectlocale=en-US&redirectslug=reset-firefox-easily-fix-most-problems for details. I’m happy to be of help, and welcome to HH! Congratulations on your fifth year! I am enjoying this site very much. Hello. I’m hoping that all is well, but it’s been two weeks without a prompt. Is everything OK with the host?